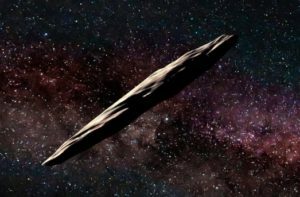 Are There Aliens on Cigar-Shaped Asteroid Oumuamua? 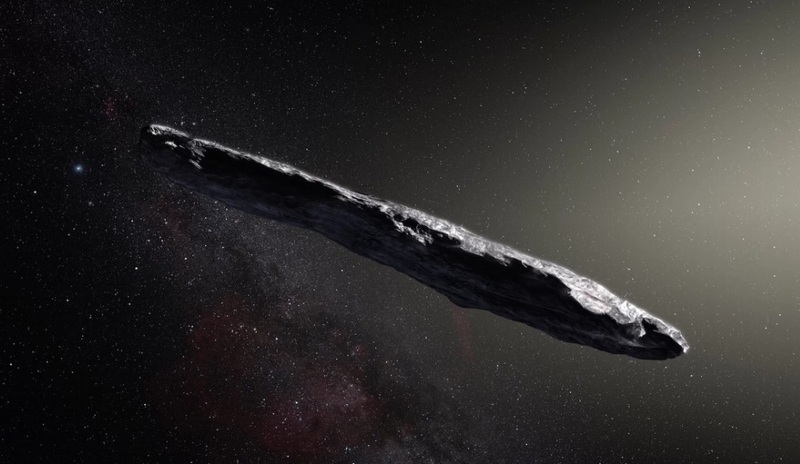 What do you think are there aliens living on the cigar-shaped asteroid Oumuamua? To find out the astronomers in the outback of Western Australia used the Murchison Widefield Array telescope to eavesdrop on the rocky visitor. They found out “We found no such signals with non-terrestrial origins,” the researchers wrote in the paper. Scientists learned about the mysterious, reddish space rock last year when it was spotted by the Pan-STARRS1 telescope in Hawaii in October. The asteroid unlike anything seen before in the Solar System. It is at least 400 meters long, dark and reddish in color. Researchers named it Oumuamua, Hawaiian for “a messenger from afar arriving first.” The name highlights Oumuamua’s unique background; it’s the first direct evidence of an object that originated in another star system and that has passed through our own solar system, Thomas Zurbuchen, associate administrator for NASA’s Science Mission Directorate at the agency’s headquarters in Washington, D.C., said in a statement. Oumuamua emerges some confusions towards people and scientists, so lerning about much more about it, researchers decided to “examine our data for signals that might indicate the presence of intelligent life associated with Oumuamua, they wrote in the study. Live Science informed “To investigate, the astronomers turned to the Murchison Widefield Array, a telescope located in Western Australia’s remote Murchison region, far away from the buzz of human activity and radio interference. They looked back at data produced by the Murchison Widefield Array during November, December and early January, when Oumuamua was between 59 million and 366 million miles (95 million and 590 million kilometers) from Earth.” The results added more evidence that Oumuamua is not a complex alien ship. if it is, it’s not talking on those frequencies. Rather, it’s most likely the fragment of a comet that lost much of its surface water after being bombarded by cosmic rays on its lengthy trek through interstellar space, the researchers said.